Grant Gaudry is an artist, but he pays his expenses by driving a pedicab in Washington, DC. Grant Gaudry picks up this Vietnamese family from California outside Washington's Museum of Natural History. He is taking them to a part of town where there are a large number of Asian restaurants. Gaudry is an artist, but he makes his living driving a pedicab. "A good pedicab driver is someone who can keep the interest of their riders because one of the biggest parts of our ride is the interaction between you and the people sitting behind you," says Gaudrey. Tourist Brandon Nguyen says, despite the traffic and bumpy streets, the experience is a lot of fun. "You're able to see both sides of the street, instead, when you are walking, you only see one side. A lot of up and down, so you feel like you are riding a horse." Pedicabs have been used in Washington for several years. Also known as bicycle rickshaws, they're also found in other major cities around the world, especially Southeast Asia. 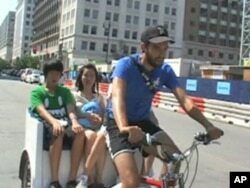 In Washington, pedicab drivers negotiate the cost of a ride with their customers. The average is about $20 for 20 minutes. Some drivers own their own cabs. Others rent their pedicabs from companies. Steve Balinsky, who once drove pedicabs in New York City, is now co-owner of Capitol Pedicabs. Balinsky says the customers come from all walks of life. "Families, a lot of couples. It's a pretty romantic thing to do, so a lot of couples like the pedicab rides. A lot of elderly, we really try to cater to the elderly." The pedicab drivers are as diverse as the tourists they pick up. Many are students and young working professionals. Others are in their 40's and 50's. Some pedicab drivers do it to keep in shape. People like Carla Chandler, 45, who has a full-time job as a television news writer. "It's fun, making extra money, and getting to meet tourists, meeting people from all over," says Chandler. "I've had riders from every state except Hawaii, a lot of international visitors. One day, in one hour, I had Iraq, Kuwait and Trinidad." Nick Smith recently bought his own pedicab. In keeping with the Washington surroundings, he painted it with the animal symbols that represent the U.S. Democratic and Republican political parties. "People ride and take a picture of it with their family," says Smith. "It's a lot of fun." Tourists seem to like the novelty of riding in a pedicab. Dida Langsdale from Florida says the experience is unique. "Breathing fresh air, being able to see the sights, covering a lot of ground in a very short period of time. It probably would have taken us 30 minutes to walk what we just rode." Capitol Pedicabs owner Balinky points out that the city of Washington is encouraging people to use bicycles more often for transportation. He says it is important to him to own a business that is environmentally friendly.